Malaysia is set to host the first ever “One Piece” exhibition at Isetan the Japan Store Kuala Lumpur starting from 26 August until 18 October 2017. The exhibition is titled “Eiichiro Oda presents Hello, ONE PIECE Luffy is Here”, and it is held to commemorate the manga’s 20th anniversary. Debuted in 1997, “One Piece” is one of Japan’s most popular manga that has been continually serialised in Japan’s best-selling manga magazine, “Weekly Shounen Jump”. Mr. Hiroyuki Nakano, Chief Editor of Weekly Shounen Jump, Sheisha Inc. The 86-volume manga is loved by many fans in Asia, Europe, the Unites States, and other various countries around the world, selling over 416 million copies worldwide, making it the best-selling manga series in history. Malaysia was chosen as the first location to hold the 20th anniversary exhibition due to its lively and vibrant culture as well as the large number of people who are receptive towards the manga trend. “Since this year is the 20th anniversary of "One Piece", there has already been a lot of "One Piece" related events going on in Japan. But we wanted to do something interesting in other countries as well,” said Mr. Hiroyuki Nakano, Chief Editor of Weekly Shounen Jump. “Also, we found out that Malaysia's fans have been very positive towards the manga, hence Shounen Jump and Dai Nippon Printing decided to work together with Isetan The Japan Store Kuala Lumpur, to bring the exhibition to this country,” he continued. (L-R) Ms. Maya Furuie, Store Manager of Isetan The Japan Store KL; Mr. Hiroyuki Nakano, Chief Editor of Weekly Shounen Jump; YBhg. Datuk Seri Mirza Mohammad Taiyab, Director General of Tourism Malaysia; Mr. Hiroyuki Orikasa, Embassy of Japan in Malaysia; and Mr. Ken Fukutake, Dai Nippon Printing Co Ltd. The exhibition introduces many various colour illustrations, a replica of Eiichiro Oda’s desk at his workplace, and also a virtual reality zone with content specially curated for this exhibition, shown for the first time in the world. TheHive.Asia got the chance to be one of the first to experience and appreciate the world of “One Piece” at the launch of the exhibition. Check out the photos of “Eiichiro Oda presents Hello, ONE PIECE Luffy is Here”! The entrance of the exhibition. 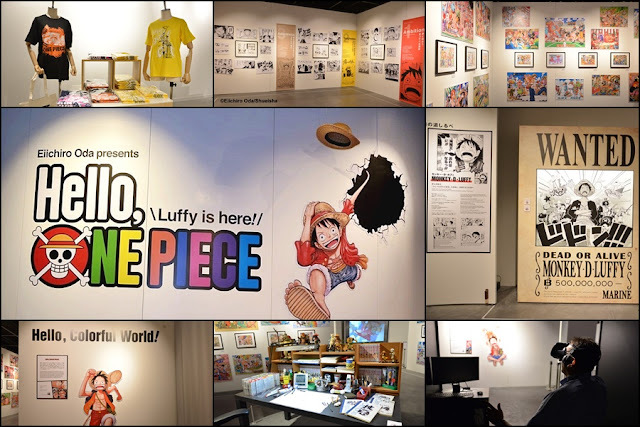 "Hello, ONE PIECE", the introduction of the exhibition and outline of "One Piece"
"Hello, Luffy" features fascinating points of the main character, Monkey D. Luffy, as well as the "One Piece" manga. Through the dialogue of various scenes in the manga, the zone highlights Luffy's quality using FIVE keywords. A giant wanted poster of Monkey D. Luffy, leader of the Straw Hat pirates. This zone expresses the colourful world of "One Piece" with original illustrations by Eiichiro Oda. The various illustration panels of "One Piece". The zone also presents the replica of Eiichiro Oda's working desk. There's also a video of the author's manga-drawing process. Take a look at the desk from another angle. A close-up of what's on the desk. The desk features various "One Piece" manga, merchandise, and figurines. At the virtual reality zone, visitors enter an immersive realm where they get to see the "One Piece" characters drawn and brought to life by Eiichiro Oda. There are four booths at the VR zone. All the original merchandise of "One Piece". There are cards and picture books. Posters, stickers, and key chains. Original t-shirts, pouches, and bags. “Eiichiro Oda presents Hello, ONE PIECE Luffy is Here” starts from 26 August to 18 October 2017, from 11am to 9pm (last admission at 8.30pm). The exhibition is located on the third floor of Isetan the Japan Store KL, at CUBE 1. Admission fee is at RM15 and RM25 (including VR experience), while for children under 4 years old, the admission is free, but they must be accompanied by parent or guardian. Do note that the VR experience is for individual age 13 and older only.